Although lauded for its ensemble cast, characters are notably absent from the first several minutes of Dustin Guy Defa’s sophomore feature, Person to Person (2017). The opening credits play over a series of immaculately-composed long shots of New York City in early autumn, glimmering on 16mm. Each shot’s content is almost aggressively mundane: a garbage truck collects trash, a small dog watches offscreen action from the curb, a pre-war building’s windows receive a touch-up. Nonetheless, the sequence never approaches banality: Defa’s film is sustained by a specific breed of nostalgia, longing for a vision of New York where the energy and beauty of autumn light prevents anything from ever feeling pedestrian. In many ways, the opening sequence seems to reflect the “actualities” of early documentary traditions—filmic representations of “life caught unawares,” not unlike those first remarked upon by Dziga Vertov, made compelling by the sheer phenomenon of cinema itself. Adapted from a short film of the same title, Person to Person explores a network of tenuous connections between New Yorkers who lead disparate lives. The film is comprised of a series of vignettes, some of which overlap momentarily while others share only the faint suggestion of proximity. Claire (Abbi Jacobson), a rookie journalist, investigates a murder while her anxious disposition and eccentric metalhead boss Phil (Michael Cera) lead her to question her career choice. Her misgivings strengthen as she apprehensively tries to interrogate Ray (Philip Baker Hall), a local watch repairman who would rather remain cloistered than acknowledge his connection to the case. Wendy (Tavi Gevinson), a sardonic high schooler, convinces her friend Melanie (Olivia Luccardi) to cut class, but ends up nervously questioning her sexual orientation as the two split off with two boys from their grade. An eccentric record collector, Bene (Bene Coopersmith), receives a lead on a rare acquisition, but soon learns that not every audiophile is as agreeable as himself. While he’s gone, his best friend Ray (George Sample III), who has been crashing on Bene’s couch in the aftermath of a breakup, leaves the house for the first time in days as he tries to mitigate a crisis of computer illiteracy. While these stories occasionally intertwine, each is presented as a portrait in its own right. Rather than architecting clearly intersecting narratives, Defa leaves the precise nature of the characters’ interpersonal connections open-ended. Something about this choice feels irrationally compassionate: the series of moments we see are so unimportant that they seem barely of consequence to one another, yet Defa nevertheless deems each one worthy of all the glamorous trappings of a big screen creation. This elevated depiction of the everyday works in part because Defa centers his film in a lo-fi vision of New York fashioned from moments where the city’s mundane reality turns to a transcendent beauty: gauzy evening light on an apartment’s brick wall, the aboveground portion of the S Train speeding through foliage, the lively streets of Chinatown in soft focus and muted color. But the the narrative’s more sinister contours darken the film’s rosy, nostalgic imagery. When Claire reports to her new bureau to find that she’s covering a possible murder investigation, her colleagues are more shocked by her distress than by the notion of the murder itself. “It’s big, and it’s not big, depending on how you see it,” Phil explains dryly. “Terrible things happen every day in this city.” And they do: Claire’s journalistic revelations never make the front page; they’re overshadowed by a stabbing in Central Park, a fact relayed to her with casual detachment. One of the film’s boldest emotional moments—and the momentary juncture between Claire’s life and Wendy’s, emblematic of the film’s network of attenuated connections—comes when Wendy, leaving the park after a reluctant double-date, winds up in a crowd of fellow park-goers shoving towards a line of police tape. What’s cordoned off behind the police line is never pictured; instead, the camera lingers on Wendy’s look of horrified fixation. This underlying fascination with the grotesque prevents Defa’s film from waxing too sentimental. The New York of the 1970s, which the film nods to in its aesthetic, was remembered for its homicide rate as much as its independent cinema, after all. For a film shot on 16mm, Person to Person seems not to fetishize analog. 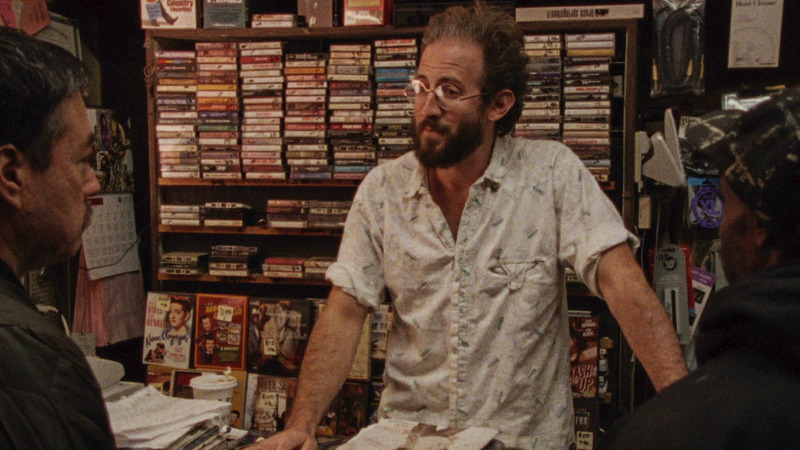 Although certain features of each storyline—Bene’s dedication to rare vinyl, for example, or Jimmy’s habit of listening to baseball games on the radio while he repairs watches—are endearingly dated, the film never attaches a value judgement to either the vintage or the new. In the end, Bene’s records and Jimmy’s timepieces contribute as meaningfully to their undoing as do Wendy and Melanie’s iPhones. Just as Wendy and Melanie retreat into their phones once in-person conversation runs dry, Jimmy hides behind his radio to avoid divulging to Claire any case-confirming details, and Bene’s concerns about a record forgery remind us that piracy is not exclusive to the digital age. Defa is careful not to conflate the tangible with the real. If any thread can be said to unite these disparate storylines, it is an exploration of how expectations of authenticity are (perhaps mistakenly) written onto the past in retrospect, breeding a nostalgia for the lo-fi. Therein lies the film’s great narrative innovation: by tracking the disparate storylines of New Yorkers across three generations, Defa allows several distinct time periods to exist simultaneously, at once concurrent and continuous. This simultaneity, perhaps, is what makes Person to Person feel like such a faithful representation of New York: the city seems to exist outside the logical boundaries of time as dizzying modernity and hardened tradition exist in concert. Written by: Addie Glickstein on September 27, 2017. Last revised by: Double Exposure, our reviewer, on October 15, 2017.